Canada: "Defense Scheme No 1" is developed, should America invade Canada. The plan calls for a rapid offense and occupation of Seattle, Great Falls, Minneapolis and Albany to buy time for British reinforcements to arrive. The plan will be terminated in 1928 and WWII will solidify an enduring friendship between the US and all nations of the United Kingdom. 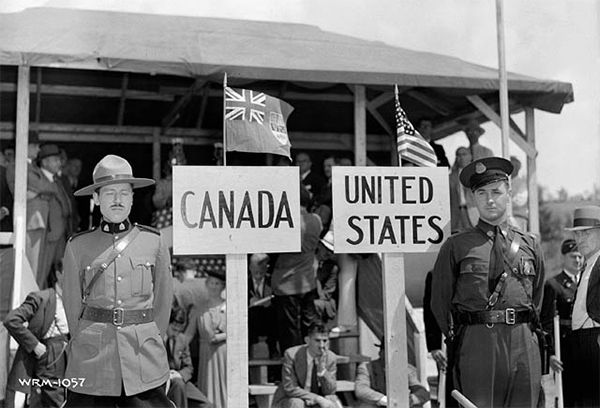 01 Aug 41: A Royal Canadian Mounted Police Officer and a Maine State Trooper stand on their respective side of the Canada-US border. The relationship between America and the British Empire became very strained during the interwar years and British feeling against America was known to be reciprocal. Even Winston Churchill later said that while people regarded a war with the US as inconceivable, it was not. After the 1918 Armistice and throughout the 20s and into the 30s, America's historic anti-British feelings handed down from the 19th century were running dangerously high, due in part to Britain owing the US billions for their intervention in the Great War and the devastating impact of the worldwide depression. Many things contributed to building a lot of tension, not only between the US and Britain, but between other nations of the British Empire. All governments make "worst case scenario" contingency plans which are kept under wraps from the public, but the "war games" between the US and Canada were much more palpable at the time. Germany: The Deutsche Studentenschaft (student activists) declare a four-week program of cultural cleansing, which will culminate on 10 May 33 with a mass burning of blacklisted banned books (ie Jewish, Marxist and other "un-German" literature). CBI - China: Day 102 of 142 of the 1st Battle of Hebei. Germany: The German justice department issues orders to prevent "improper usage of protective custody" to prevent those who did not deserve to be sent to concentration camps from being sent there. This ruling will remain valid until 1938. Spain: Day 270 of 985 of the Spanish Civil War. Spain: Day 635 of 985 of the Spanish Civil War. CBI - China: Day 280 of 2,987 of the 2nd Sino-Japanese War. Day 65 of 124 of the Battle of Henan. Day 20 of 39 of the Battle of Xuzhou. CBI - China: Day 645 of 2,987 of the 2nd Sino-Japanese War. Day 27 of 54 of the Battle of Nanchang. Atlantic: German sub U-37 sinks the British ship STANCLIFFE 45 miles northeast of the Shetland Islands, Scotland. In one lifeboat 16 survivors will make it to nearby Unst Island. ETO - Norway: Day 4 of 63 of the Battle of Norway. Norway announces the Germans have gained control of Kristiansand, Stavanger, Bergen and Trondheim in the south, and got Narvik in the north. Norwegian volunteers begin reactivating the old fort at Ingstadkleiva near Trondheim which will become known as the Hegra Fortress for a defense against the Germans. CBI - China: Day 1,011 of 2,987 of the 2nd Sino-Japanese War. Day 150 of 381 of the Battle of South Guangxi. Atlantic: The US establishes air and naval bases in Greenland. Atlantic: German sub U-124 sinks the British ship ST HELENA 100 miles southwest of Freetown, Sierra Leone. Atlantic: German armed merchant cruiser KORMORAN sinks the Greek ship NICOLAOS D L 920 miles southwest of British West Africa, capturing the entire crew of 38. ETO - UK: Day 219 of 258 of the Blitz. ETO - Norway: The RAF bombs the fish oil factories in Hammerfest. MTO - Yugoslavia: Day 7 of 12 of the Axis invasion of Yugoslavia. German troops capture Belgrade. On the Danube River, Luftwaffe JU-87s sink the river monitor DRAVA and force three other boats, MORAVA, SAVA and VARDAR, to be scuttled by their crews. MTO - Greece: Day 7 of 25 of the Battle of Greece. German troops capture Vevi. German SS troops overrun the British and Australian troops south of Vevi. MTO - Libya: The British sub HMS TETRARCH sinks the Italian tanker PERSIANO 55 miles northeast of Tripoli. MTO - Libya: Day 3 of 256 of the Siege of Tobruk. German troops capture Bardia. At Tobruk, the Germans encircle the town and begin a push toward Egypt. East Africa: Day 307 of 537 of Italy's East African campaign in the lands south of Egypt. CBI - China: Day 1,376 of 2,987 of the 2nd Sino-Japanese War. CBI - Thailand: Day 194 of 221 of the Franco-Thai War (Vichy France vs Thailand). Atlantic: Day 89 of 169 of Germany's Second "Happy Time," during which U-boats sink 609 Allied ships with little risk. U-203 sinks the Panamanian tanker STANVAC MELBOURNE off the coast of Wilmington, North Carolina. U-123 sinks the US freighter LESLIE near Cape Canaveral, Florida. Russian Front: Both German and Soviets troops pause their fighting as temperatures drop to -30° C (-22° F). Russian Front - North: Day 217 of 872 of the Siege of Leningrad. Russian Front - North: Day 64 of 102 of the Battle of the Demyansk Pocket, another failed attempt to break the siege at Leningrad. Russian Front - North: Day 80 of 103 of the Battle of the Kholm Pocket. Another attempt to break the siege at Leningrad. Russian Front - Center: Day 95 of 103 of the Battle of Vyazma, Russia. Russian Front - Center: Day 95 of 103 of the Battle of Sychevsk, Russia. Russian Front - Center: Day 41 of 49 of the Battle of Rzhev, Russia, a diversion to pull more German troops away from Moscow. Russian Front - South: Day 165 of 248 of the Siege of Sevastopol, Crimean Peninsula. CBI - Burma: Day 120 of 164 of Japan's Invasion of Burma. Day 2 of 9 of the Battle of Yenangyaung. Japanese troops capture Migyaungye which exposes the western flank of 1st Burma Corps at the oilfields at Yenangyuang under threat. CBI - China: Day 1,741 of 2,987 of the 2nd Sino-Japanese War. CBI - India: Pandit Nehru, leader of the Congress Party in India, promises resistance against the Axis. PTO - Malaya: Day 53 of 357 of the Battle of Timor Island. PTO - Philippines: Day 126 of 152 of the 1st Battle of the Philippines. US B-17s and B-25s bomb the harbor and shipping at Cebu, Cebu Island, while other B-17s attack Nichols Field on Luzon Island. ETO - UK: British War Office circulates the "German Long-Range Rocket Development" report, which warns of potential danger from these new weapons, the V-weapons. Russian Front - North: Day 582 of 872 of the Siege of Leningrad. Russian Front - Center: German radio announces the discovery of 4,150 bodies of Polish officers, reportedly to have been deported by the Soviets in 1940, in mass graves near Smolensk, Russia. Russian Front - North: Day 343 of 658 of the Siege of the Kholm Pocket. MTO - Tunisia: Day 147 of 178 of the Battle of Tunisia. RAF and US Air Forces provide Allied air support. The British 8th Army captures Sousse. MTO - Italy: US 9th and 12th Air Forces attack targets at Cosenza, Crotone, Naples and Pizzo. RAF Liberators bomb at Palermo and Messina, Sicily. CBI - Burma: Day 64 of 79 of the Allied Operation LONGCLOTH. US 10th Air Force provides air support. CBI - China: Day 2,106 of 2,987 of the 2nd Sino-Japanese War. PTO - Alaska: Day 310 of 435 of the Battle of Kiska, Aleutian Islands. US 11th Air Force bombs seven times on Kiska and Little Kiska. PTO - Japan: The USS FLYING FISH sinks a Japanese freighter off the coast of Honshu. PTO - New Guinea: Japanese planes attack the Allies at Port Moresby. US 5th Air Force hits a variety of targeted areas. PTO - Solomon Islands: Day 12 of 16 of Japan's Operation I-GO. Japanese attack on Port Moresby with 131 Zeros and 43 Mitsubishi G4M2 "Betty" medium bombers. Opposed by 44 Allied fighters, the attack results in two Allied and five Japanese aircraft lost. Spain: The last of the convoys carrying Spanish volunteers of the recently disbanded German Army's "Blue Legion" arrives in Spain. ETO: US 9th Air Force B-26s and A-20s attack railroads, shore batteries, radar installations, airfields and V-weapon sites in France and Belgium. Russian Front - Finland: A Soviet demand for peace is rejected by Finland. Russian Front - North: Day 71 of 191 of the Battle of the Narva Isthmus, Estonia. Both German and Soviet troops remain in their defensive positions. Russian Front - South: Day 111 of 113 of the USSR's Dnieper-Carpathian Offensive in southwestern Ukraine. Russian Front - South: Day 40 of 45 of the Battle of Chernovtsy, Ukraine. Russian Front - South: Day 38 of 44 of the Battle of Snigirevka, Ukraine. Russian Front - South: Day 5 of 35 of the Battle of the Crimea. German and Romanian troops begin withdrawing from Sevastopol. Russian Front - South: Day 18 of 20 of the Battle of Odessa, Ukraine. Russian Front - South: Day 5 of 60 of the Battle of Romania, 1st Jassy Offensive. Axis troops successfully hold off the Soviet offensive at Targu Frumos. MTO: US 15th Air Force B-17s and B-24s attack targets in Austria and Yugoslavia. MTO - Italy: King Vittorio Emanuele III of Italy transfers most of his power to Crown Prince Umberto, though he is still on to the throne. MTO - Italy: Day 87 of 123 of the Battle of Monte Cassino. RAF and US Air Forces provide air support. MTO - Italy: Day 82 of 136 of the Battle of Anzio. RAF and US Air Forces provide air support. CBI - Burma: Day 39 of 166 of the UK's Operation THURSDAY. CBI - Burma: Day 34 of 147 of the Battle of Myitkyina. US 10th Air Force provides air support. CBI - Burma: Day 12 of 302 of the Chinese Salween Offensive. US 14th Air Force provides air support. CBI - China: Day 2,472 of 2,987 of the 2nd Sino-Japanese War. CBI - India: Day 36 of 118 of the Battle of Imphal-Kohima. Day 2 of 4 of the Battle of Bunker Hill outside Kohima. PTO - Marshall Islands: US 7th Air Force bombs the Jaluit and Maloelap Atolls. PTO - New Guinea: Day 44 of 80 of the Battle of the Admiralty Islands. 5th Air Force provides air support. PTO - New Guinea: Day 207 of 219 of the Battle of Shaggy Ridge. 5th Air Force provides air support. US troops clear Pak Island. PTO - New Guinea: Day 120 of 597 of the Battle of New Britain. US 13th Air Force provides air support. The majority of New Britain Island is now held by the Allies. PTO - Philippines: The USS FINBACK attacks a six-ship Japanese convoy escorted by three patrol vessels, scoring 5 hits. Afterward she is counter-attacked with depth charges. PTO - Solomon Islands: Day 164 of 295 of the Battle of the Bougainville Islands. US 13th Air Force provides air support. USA: President Roosevelt dies of a stroke at his health and relaxation retreat in Warm Springs, Georgia. He is succeeded by Harry S Truman. 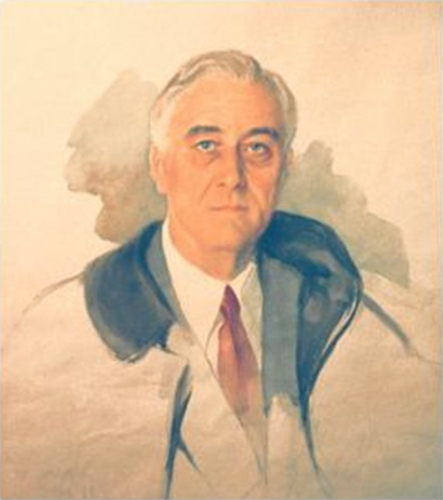 At the time he collapsed, Roosevelt had been sitting for a watercolor portrait by artist Elizabeth Shoumatoff. She had begun working on the portrait around noon on April 12, 1945. FDR was being served lunch when he said "I have a terrific pain in the back of my head." He then slumped forward in his chair, unconscious, and was carried into his bedroom. The president's attending cardiologist, Dr Howard Bruenn, diagnosed a massive cerebral hemorrhage (stroke). At 3:35 pm that day, Roosevelt died. Shoumatoff never finished the portrait. It hangs unfinished at Roosevelt's former health and relaxation retreat in Warm Springs, Georgia, known as the "Little White House." The day following FDR's death, reporter Ed Clark drove to cover the funeral procession taking the flag-draped coffin to the train station, but found swarms of photographers trying to get the best view. 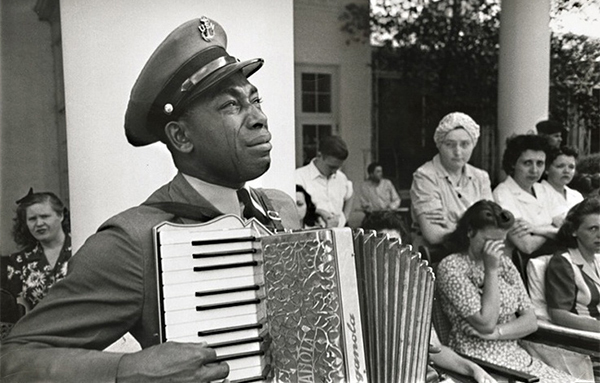 Clark heard one of Roosevelt's favorite hymns "Goin' Home" being played on an accordion. He snapped a shot of Navy bandsman Graham Jackson with tears streaming down his face as he played. No one else had seen what Clark had seen, and his dramatic photograph became the symbol of a nation in grief. Jackson had become a personal friend of Eleanor and President Franklin D Roosevelt, and had played command performances in Washington numerous times. He was present in Warm Springs, Georgia, when Roosevelt died. The two had been collaborating at the Little White House on a version of Dvorak's "Goin' Home" the day before. ETO - Netherlands: British troops capture Westerbork, Brummen and Deventer. The Westerbork Concentration Camp at Hooghalen is liberated by the Canadian 2nd Infantry Division. ETO - France: Day 257 of 284 of the Battle of Brittany. ETO - France: Day 210 of 236 of the Siege of Dunkirk. ETO - Germany: Day 38 of 46 of the Battle of the Ruhr Pocket. US 9th Air Force provides air support. The US 3rd Army captures Erfurt while the US 9th takes Brunswick. ETO - Germany: Day 9 of 9 of the Battle of Heilbronn. After nine days of house-to-house fighting, the German troops surrender the town to the US 7th Army. ETO - Germany: Free French troops capture Baden-Baden in southwestern Germany. The British 2nd Army captures Celle 60 miles south of Hamburg. Allies liberate the Buchenwald and Belsen concentration camps. Germany: Heinrich Himmler issues orders stating that commanders who fail to hold key positions in the defense of Germany will be executed. A German war communiquß confesses that three days ago Königsberg actually did surrender to the Soviets, so therefore, the death penalty is issued for its commander, General Lasch. Russian Front - Finland: Day 210 of 223 of the Lapland War. Finland and Russia have joined forces to kick the Germans out of Finland's most northern province. Russian Front - Center: Day 180 of 206 of the Battle of the Courland Pocket in Latvia. Russian Front - Center: Day 59 of 83 of the German Siege of Breslau (today Wroclaw, Poland). The Soviets continue with their siege. Russian Front - South: Day 18 of 21 of the Battle of Nagykanizsa-Körmend, western Hungary. Russian Front - South: Day 31 of 34 of the Battle of Vienna, Austria. MTO - Yugoslavia: The German troops evacuate from Zenica. MTO: US 15th Air Force hits targets in Italy and Austria. MTO - Italy: Day 7 of 27 of Operation GRAPESHOT, a successful offensive in northern Italy. MTO - Italy: Day 4 of 13 of the Battle of Bologna. MTO - Italy: Day 1 of 8 of the Battle of the Argenta Gap. The Allies will gain this valuable ground south of the Po River. CBI - Burma: Day 68 of 99 of the Battle of Pakokku and Irrawaddy River operations in central Burma. The US 10th Air Force provides air support. CBI - China: Day 2,837 of 2,987 of the 2nd Sino-Japanese War. Day 12 of 91 of the Battle of Zhijiang. US 14th Air Force provides air support. Day 4 of 60 of the Battle of West Hunan (near Zhijiang). PTO - Alaska: US 11th Air Force P-38s shoot down paper bomb-balloons over Attu Island. PTO - Japan: An order is sent by radio to the USS SNOOK to take out a lifeguard station off the Sakishima Islands, Ryukyu Islands. She fails to respond. PTO - Japan: US 20th Air Force B-29s night bomb the Nakajima aircraft factory and the Shizuoka engine plant in Tokyo and a chemical plant over at Koriyama. PTO - Japan: Day 12 of 83 of the Battle of Okinawa. The Japanese attack the US fleet, sinking the destroyer USS MANNERT L ABELE, thus becoming the first ship hit by an Ohka bomb and the only one to be sunk by one. PTO - New Guinea: Day 472 of 597 of the Battle of New Britain. US 10th Air Force provides air support. PTO - New Guinea: Day 356 of 481 of the Battle of Western New Guinea. US 10th Air Force provides air support. PTO - Philippines: Day 175 of 299 of the 2nd Battle of the Philippines, aka the Liberation of the Philippines or the Philippines Campaign. PTO - Philippines: Day 119 of 244 of the Battle of Luzon. 5th Air Force provides air support. PTO - Philippines: Day 34 of 159 of the Battle of Mindanao Island. 5th Air Force provides air support. PTO - Philippines: Day 26 of 135 of the Battle of the Visayas region. US 5th and 7th Air Forces provide air support. Switzerland: The League of Nations holds its final meeting in Geneva, concerning itself with liquidating the League and turning its assets over to the United Nations. The motion that dissolves the League is passed unanimously.